Science says go for it. Bigfoot. The deadly combo of Pop Rocks and cola. Uncontrollable holiday weight gain. Turns out, not even that last one was ever real. When National Institutes of Health researchers looked into the oft-repeated claims that most people pack on five or more pounds between Thanksgiving and New Year’s (some estimates have gone as high as 10! ), they found the actual average gain was less than a pound. The key word here? Planned. Spur-of-the-moment splurges can set in motion what University of Toronto researcher Janet Polivy, Ph.D., has dubbed the “what-the-hell effect”: You feel like you’ve already blown it, so why not chow down? “You don’t want to be heavily restrictive about what you eat during the holidays, nor do you want to go overboard to the point of discomfort,” says Mann. Get a head start on starch. 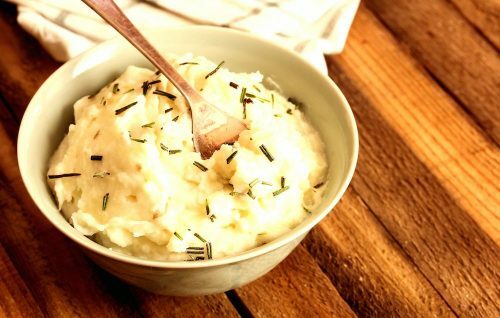 Cooking and then cooling potatoes, pasta, and rice converts some of their carbs into what’s known as resistant starch, a fiber-like substance that your body can’t digest. As it passes through your system, it occupies space in your stomach, filling you up. Besides helping you feel sated, one study showed that replacing just over 5 percent of a meal’s carbohydrates with resistant starch increases fat burning by about 20 percent. So at least 12 hours before the big meal, cook any potato, pasta, or rice dish you plan to serve. The effect persists even when you reheat, so you’ll save both time and calories at your dinner. Once you’ve cooked the spuds ahead, lighten them more by using a contraption called the Smood ($25, dreamfarm.com). Its shape—a cross between a whisk and a plunger—is perfect for making fluffy potatoes without cream or butter. Other handheld mashers require a lot more elbow grease and still leave chunks behind, but this tool forces potato between gaps in the coil to iron out lumps. If you want to indulge in white bread on your cheat day rather than the more blood-sugar-friendly wheat, try this: Freeze it, then pop it in the toaster. That will lower its glycemic index (a measure of how quickly a food spikes blood glucose) by nearly 50 percent, according to a study in the European Journal of Clinical Nutrition. Researchers suspect the two-step process changes the structure of the starch molecules in bread, leading it to behave more like a complex carb (those good-for-you whole grains) than a simple one (the nonfilling, fast-digesting, refined baddies). Result: fewer blood-sugar roller-coaster rides that promote cravings. Canned food = processed food. And the more processed a food, the faster your body can turn it into glucose, a.k.a. sugar. Biologists at Pomona College served calorically identical meals, but gave one group food made with processed ingredients while the other group was served whole foods. When they measured diet-induced thermogenesis—the additional calories burned when eating and digesting—in the hours afterward, it was nearly 50 percent higher in the group that ate the unprocessed meal. Swap canned green beans for fresh, and store-bought fried onions for caramelized ones or toasted nuts, which provide the same crunch but have healthier fats. In sweet potato casserole, nix the marshmallows and top with a mixture of fat-free Greek yogurt, honey, chopped mint, toasted walnuts, and a pinch of salt, suggests chef Isaac Bancaco of the Andaz Maui at Wailea Resort in Hawaii. This article was originally published in the November 2016 issue of Women’s Health, on newsstands now.